Arguably the first hard rock album released by the Motown-owned Rare Earth imprint, 1970's The Gospel According to Zeus was also the first and last recording by Detroit heavy rockers Power of Zeus. Needless to say, these two facts were inextricably linked, as the producers and engineers responsible for fueling the Motown hit factory had little or no understanding of what it took to capture the new decade's Earth-shaking hard rock sounds in their studios. 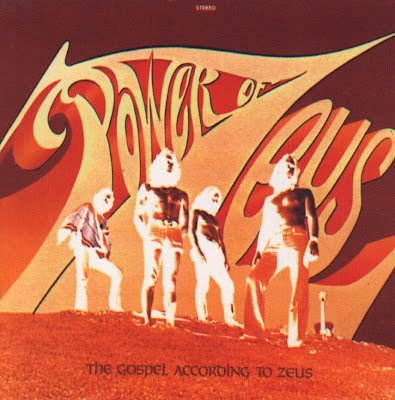 Interestingly, this wound up pushing Power of Zeus' psychedelic elements -- mostly evident in their vocal harmonies and use of the Hammond organ -- to the fore at the expense of a meatier guitar, bass, and drums foundation. Also, unlike many of the era's incredibly bloated, jam-happy behemoths (e.g., Iron Butterfly's "In-A-Gadda-Da-Vida," Deep Purple's "Child in Time"), tough, punchy songs like "It Couldn't be Me," "No Time," and "Realization" are conspicuously short and concise -- as mandated by Motown's pop architects, no doubt. And if you're expecting distortion, forget it. The uniquely forceful "The Sorcerer of Isis (The Ritual of the Mole)" offers about the only opportunity for the band to really cut loose with some instrumental overload and actual guitar shredding (fitting that they cited it as the most representative of their live shows). More often than not, however, it was trippy acoustic guitars and harpsichords that had Baroque folk ballads like "Green Grass and Cover" and "Uncertain Destination" breaking up the pacing; and the ominous-sounding "The Death Trip" is actually a rather sleepy, almost Pink Floyd-like swirl of a song. In other words, for a band professing to love the hard psych-rock of Cream and the Jimi Hendrix Experience and the proto-metal of Led Zeppelin and Black Sabbath, The Gospel According to Zeus is obviously a sonically stunted effort. And yet ironically, what at the time doomed both the band and album's chances of success has since transformed it into a true original outside any identifiable genre.